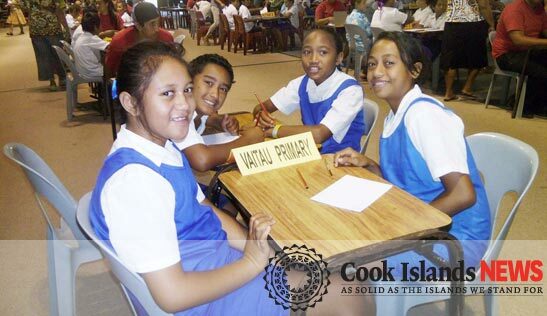 A team from Vaitau School relax before the maths competition at the National Auditorium begins. national maths quiz run by the Ministry of Education. With 16 schools participating, the Ministry of Education says it was a frantic yet exhilarating experience for the crowds of spectators who cheered on their school teams at the National Auditorium. Groups of three to four students hovered over question sheets, aiming to solve 20 questions within 20 minutes, with running scores entered for every correct answer signalled by the markers. The competition had a good turn out of entrants and supporters, with organiser Strickland Upu, manager of curriculum and pedagogy for the learning and teaching department the ministry, saying the event was all fun. “It was so encouraging last night to see the engagement, enthusiasm and energy as the teams knuckled down to test their ability to work together to solve mathematical problems,” said Kathryn Cheval, learning and teaching advisor for numeracy and technology at the ministry. This year there were five quiz rounds for year 6 to year 10 students, with schools taking part including Araura Primary, Araura College, Arorangi, Avarua, Avatea School, Enuamanu, Mangaia, Mauke, Nukutere College, Papaaroa Primary, Papaaroa College, Rutaki, St Josephs, Takitumu, Tereora College, Te Uki Ou, Titikaveka College, and Vaitau. The sister islands’ schools turned heads as they made their presence known by winning in some of the top three places of the quiz, particularly when Araura College grabbed first place in the year 10 round. Avatea School took first place in year 6, with Avarua taking lead for year 7, Nukutere walking away with first prize for the year 8 rounds and Tereora College making sure that they got year 9 first prize. The highest Rarotonga team score was given to Nukutere College, with Araura Primary School winning this special prize for the Pa Enua Schools. For the ministry the quiz aims to bring an element of fun to maths, while encouraging the key skills of problem solving and teamwork, as well as developing standards of excellence and increasing awareness of the subject in the community. The ministry of education would like to acknowledge the ever-supportive contribution of their sponsors ANZ Bank, Air Rarotonga, CITC, Moana Gems, KPMG, T-Shirt Factory, HSBC Trustee, Asiaciti, Southpac, Vaima Pacific Spring Limited, Bank of Cook Islands, Portcullis Trustnet Ltd and the Cook Islands Trust Corporation Limited, as well as the many teachers, students and ministry staff who assisted at the event. Year 6 – 1st Avatea 2-Naomi Teataiariki, Teaupare Wichman, Erina Tangata, Sharez Makikiriti, 2nd St Joseph 1-Rosie Burns, Tschan Hagai, Jolene Monga, Eryca Tommy, 3rd Araura Primary-Kalani Taputoa, Sammie Henry, Ocean Bartlett, Emual Manapori. Year 7– 1st Avarua 1-Miara Kelleher, Roimata Hagai, Riana Pakeno, McKinzie Laursen, 2nd Nukutere 1-Teei Tuteru, Teariki Tuteru, Jacqueline Purea, Jasmin Naslund, 3rd Te Uki Ou-Isabel Drollet, Natalia Steens, Tessa Worthington, Khan Metuarau. Year 8 – 1st Nukutere 1-Tyler Davis, Geneva Miles, Oliver Burns, Ryan Nicholson, 2nd Te Uki Ou 1-Terall Timoti, Finn Pearson, Timothy Reeves, 3rd Avatea 1-Nay Chi Myo Min, Adoni Rairoa, Kiana Puna, Rachel Scheel. Year 9 – 1st Tereora 2-Al Jermaine Epati, Frederik Markwell, Ben Oti, Otis Burrell, 2nd Tereora 1-Thomas Beniamina, Tepapa Hunt, Selane Tairea, Serena Murchie, 3rd Enuamanu-Siuea Tairi, Junior Windy, Tereapii Punua, Tenia Tauraa. Year 10 – 1st Araura College 1-Liana Eyre, Terani Upokomanu, Pearl Mataiti, Tapereatiki Tepaki, 2nd Papaaroa 1 (Etueni Vakalalbure, Jodaema Toleatoa, Marise Tutai Noovao, Matthew Atuatika, 3rd Enuamanu-Nikolasi Niumeitolu, Josephine Tiatoa, Kayla Whitcher, Marianna Vainerere. Special Prizes (sponsored by CITC for year 6 to 8) year 6 –Avatea 2, Year 7– Avarua 1, Year 8– Nukutere 1. Highest team score (sponsored by Moana Gems) Rarotonga – Nukutere College Year 8, Pa Enua – Araura Primary year 6.